It is part of the Truman Sports Complex with adjacent Kauffman Stadium, the home of the Kansas City Royals of Major League Baseball (MLB). Arrowhead Stadium has a seating capacity of 76,416, making it the 27th largest stadium in the United States and the sixth largest NFL stadium. It is also the largest sports facility by capacity in the state of Missouri. A $375 million renovation was completed in 2010. When the Dallas Texans of the American Football League (AFL) relocated to Kansas City in 1963 and were renamed the Kansas City Chiefs, they played home games at Municipal Stadium, which they shared with the Kansas City Athletics of Major League Baseball. The A's left for Oakland after the 1967 season and were replaced by the expansion Kansas City Royals in 1969. Municipal Stadium, built in 1923 and mostly rebuilt in 1955, seated approximately 35,000 for football. 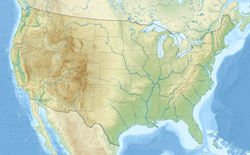 As part of the AFL–NFL merger announced in 1966, NFL stadiums would be required to seat no fewer than 50,000 people. The City of Kansas City was unable to find a suitable location for a new stadium, so Jackson County stepped in and offered a location on the eastern edge of Kansas City near the interchange of Interstate 70 and Interstate 435. Voters approved a $102 million bond issue in 1967 to build a new sports complex with two stadiums. The original design called for construction of side-by-side baseball and football stadiums with a common roof that would roll between them. The design proved to be more complicated and expensive than originally thought and so was scrapped in favor of the current open-air configuration. The two-stadium complex concept was the first of its kind. The Chiefs staff, led by team general manager Jack Steadman, helped develop the complex. Construction began in 1968. The original two-stadium concept was initially designed by Denver architect Charles Deaton and Steadman. Deaton's design was implemented by the Kansas City architectural firm of Kivett & Myers. Arrowhead is considered by some to have had an influence on the design of several future NFL stadiums. Construction of the stadium was a joint venture Sharp-Kidde-Webb construction firms. Construction on Arrowhead Stadium was completed in time for the 1972 season. On August 12, 1972, the Chiefs defeated the St. Louis Cardinals 24–14 in the first preseason game at Arrowhead Stadium. Later on during the 1972 regular season, the largest crowd to see a game in Arrowhead Stadium was 82,094 in a Chiefs game against the Oakland Raiders on November 5. In 1973, the stadium was the first in the NFL to include arrows on the yard markers to indicate the nearer goal line (initially, they resembled little Indian arrowheads). This practice would eventually spread to the other NFL stadiums throughout the 1970s, becoming mandatory league-wide in the 1978 season (after first being used in Super Bowl XII), and become almost near-universal at the lower levels of football. On January 20, 1974, Arrowhead Stadium hosted the Pro Bowl. Due to an ice storm and brutally cold temperatures the week leading up to the game, the game's participants worked out at the facilities of the San Diego Chargers. On game day, the temperature soared to 41°, melting most of the ice and snow that accumulated during the week. The AFC defeated the NFC, 15–13. In 1984, the Jackson County Sports Authority re-evaluated the concept of a fabric dome. The concept was disregarded as being unnecessary and financially impractical. Arrowhead hosted the Drum Corps International World Championships in 1988 and 1989. In 1991, two Diamond Vision screens shaped as footballs were installed. In 1994, other improvements were made and natural grass playing surface was installed, replacing the original artificial Astroturf playing field. In 2009, Arrowhead Stadium completed the installation of a multimillion-dollar integrated system from Daktronics out of Brookings, South Dakota. Two high definition video displays were retrofitted into the existing football-shaped displays in both end zones. Approximately 1,625 feet (495 m) of digital ribbon board technology was also installed in the stadium. In 1990 in a game against the Denver Broncos, the Chiefs were threatened with a penalty if the crowd would not quiet down. After John Elway was backed up to his own goal line and unable to even run a play he quickly spoke to the referee. After listening to Elway the referee said "Any further crowd-noise problem will result in a charged timeout against Kansas City. Thank you for your cooperation." On October 13, 2013, in a game between the Chiefs and Oakland Raiders, the crowd at the stadium set a Guinness World Record for the loudest stadium, with 137.5 dB. That record would be broken by Seattle Seahawks fans at CenturyLink Field on December 2, 2013, at a home game against the New Orleans Saints. Seattle gained the record by reaching a noise level of 137.6 decibels. The Chiefs reclaimed the title on September 29, 2014 in a Monday Night Football game against the New England Patriots, hitting 142.2 decibels. On September 20, 2015, the Buffalo Bills attempted to break the noise record in a home game against division rival New England Patriots, but fell short of the mark. It was not released what the decibel reading was. Arrowhead Stadium has hosted five Big 12 Conference football championship games: Kansas State versus Oklahoma in 2000 and 2003, Colorado versus Oklahoma in 2004, Nebraska versus Oklahoma on December 2, 2006, and Missouri versus Oklahoma in 2008. 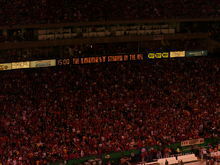 From 2007 to 2011, Arrowhead hosted the Border Showdown between the Kansas Jayhawks and the Missouri Tigers. The 2007 game between the #2 Jayhawks and #3 Tigers, drew the second largest crowd in stadium history, at 80,537, with the Tigers winning 36-28. Kansas also played Oklahoma at Arrowhead in 2005. In 2009 and 2010, Arrowhead hosted football games between the Iowa State Cyclones and the Kansas State Wildcats. Iowa State previously played at Arrowhead against the Florida State Seminoles in the 2002 Eddie Robinson Classic. The stadium also played host to the annual Fall Classic at Arrowhead, a Division II game that featured Northwest Missouri State University and Pittsburg State University. The 2004 game featured No. 1 Pittsburg State defeating No. 2 Northwest Missouri State in the only Division II game to feature the nation's top two teams playing in the regular season finale. With the formation of Major League Soccer in 1996, Arrowhead became home to the Kansas City Wiz (later renamed the Wizards). After the 1996 season, the team was renamed the Wizards. They left after the 2007 season, after being sold by the Hunt Family to On Goal, LLC, once their lease ended. This was also beneficial so that construction work on Arrowhead's renovation could take place during the NFL off-season. The Wizards moved to CommunityAmerica Ballpark in 2008 and did not return to Arrowhead except for one friendly. 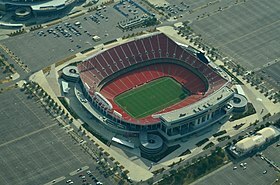 That friendly was played on July 25, 2010, the Kansas City Wizards faced Manchester United at Arrowhead Stadium for the English team's third preseason friendly in America during 2011. Due to ticket demand, they could not play the game at their new home stadium, CommunityAmerica Ballpark. The match ended with Kansas City beating the Manchester Club 2-1 with Dimitar Berbatov scoring the only goal for Manchester United on a penalty kick. A B-2 Spirit stealth bomber, based at nearby Whiteman Air Force Base, flies over Arrowhead prior to the 2006 Chiefs-Raiders game. On April 4, 2006, Jackson County voters approved a tax increase to finance municipal bonds to pay for $850 million in renovations to Arrowhead and nearby Kauffman Stadium. Before the bond election, the NFL awarded the 49th Super Bowl in 2015 to Kansas City provided it would have a climate controlled stadium. With the passing of the stadium bill, the Chiefs signed a new lease which ensures that the team will remain at Arrowhead until at least 2031. However, a second bond issue to put a rolling roof over the stadium was defeated by voters, and Kansas City chose to withdraw its request to host Super Bowl XLIX in 2015; the game would ultimately go to University of Phoenix Stadium in Glendale, Arizona. On August 15, 2007, the Chiefs announced final plans for the renovated Arrowhead Stadium, which would cost $375 million. The cost to the city was reduced by $50 million thanks to an additional payment by the Hunt family, which originally had intended to donate $75 million. The renovated stadium features the Chiefs Hall of Honor, a tribute to Lamar Hunt, and "horizon level" seating in which luxury suite owners are now sitting outdoors. Reconstruction for the stadiums started on October 3, 2007. Refurbishment of nearby Kauffman Stadium, home to the Kansas City Royals baseball team, commenced at that time, and both completely-refurbished stadiums were ready for play by the 2010 season. From 1963 to 2008, the TD Pack Band was a mainstay at every Chiefs home game. The band was founded by trumpeter Tony DiPardo. The band was previously known as The Zing Band while the Chiefs played at Municipal Stadium. DiPardo, nicknamed "Mr. Music", was born in St. Louis, Missouri on August 15, 1912. DiPardo has written songs about the team such as "The Chiefs are on the Warpath" and "The Hank Stram Polka". DiPardo earned a Super Bowl ring for the Chiefs' victory in Super Bowl IV. ^ Rogers, Thomas (December 13, 1976). "Colts Rout Bills, 58-20, for Title; Steelers Playoff Foe". The New York Times. Retrieved October 22, 2011. ^ Covitz, Randy (September 8, 1995). "Chiefs Make KC's Pitch for Big 12 Football Title Game Arrowhead is Biggest of Four Stadiums in the Running Get Event". The Kansas City Star. Retrieved October 22, 2011. ^ Felser, Larry (September 21, 1997). "Chiefs Master the Art of Marketing in a Small Market". The Buffalo News. Retrieved October 22, 2011. ^ "Truman Sports Complex Renovation Newsletter" (PDF). Jackson County Sports Complex Authority. Jackson County Sports Complex Authority. January 2010. Archived from the original (PDF) on 2011-12-02. ^ Everly, Steve (January 13, 1991). "Engineering Firm's Founder Has Retired". The Kansas City Star. Retrieved May 7, 2012. ^ "Stadium History". Team History. Chiefs War Path. Retrieved October 18, 2011. ^ "Webb Spinner, 1969-1970" (PDF). ^ "Kansas City Chiefs Contract with Daktronics for HD Video Displays". ^ "Chiefs Ready for Playoff Nemesis Indianapolis". The Topeka Capital-Journal. 2004. Archived from the original on 2008-10-05. ^ "Celtic's win over Rangers made Hampden roar like a lion, say sound experts". BBC Sport. BBC. 17 April 2018. Retrieved 18 April 2018. ^ "Remember When: Chiefs crowd makes life hard for Elway in 1990". CBSSports.com. Retrieved 2016-01-03. ^ Kuhla, Andrew. "Arrowhead Sets World Record For Loudest Stadium". Fansided. Retrieved 13 October 2013. ^ Schwab, Frank (2 December 2013). "Seahawks take back the Guinness World Record for crowd noise at 137.6 decibels". Yahoo! Sports. Retrieved 2 December 2013. ^ Peters, Micah (29 September 2014). "Chiefs break Guinness crowd noise record at Arrowhead against the Patriots". USAToday.com. Retrieved 29 September 2014. ^ "Bills' attempt to break Guinness World Record was 'ridiculous,' Noise Free America says". Syracuse.com. ^ "Missouri Beats Kansas". Associated Press. November 24, 2007. Archived from the original on December 16, 2008. Retrieved November 25, 2007. ^ "Cyclone Football Team to Play in Kansas City". cyclones.com. Iowa State University Athletic Department. Retrieved 27 November 2013. ^ "T-Bones Welcome Major League Soccer to CommunityAmerica Ballpark". tbonesbaseball.com. Kansas City T-Bones. Retrieved 19 April 2013. ^ No rolling roof, no Super Bowl at Arrowhead Associated Press. May 25, 2006. ^ "Mr. Music is ailing". Kansas City Chiefs. March 19, 2008. Archived from the original on 10 January 2009. Retrieved December 31, 2008. 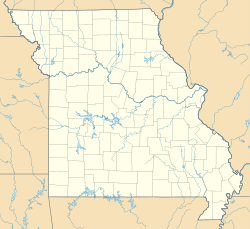 Wikimedia Commons has media related to Arrowhead Stadium.